Stanford defeated Rice 41-17 to close the 2016 regular season. 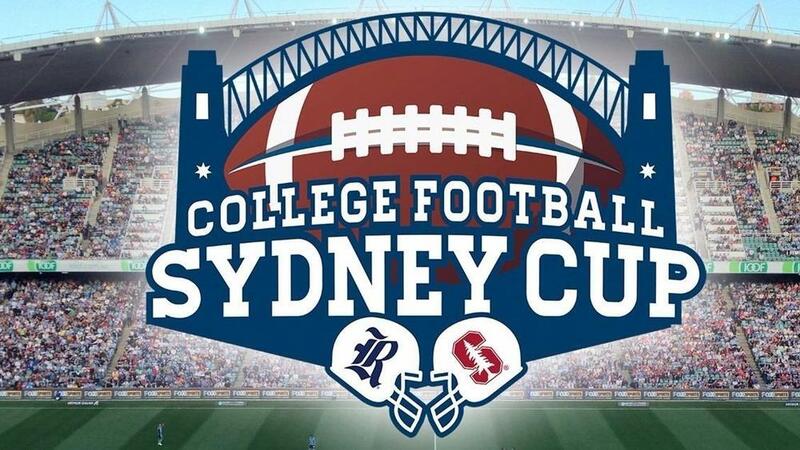 The Rice Owls will open their 2017 season facing the same opponent they met in the 2016 finale --but in a far more exotic local--as Rice and Stanford inaugurate the 2017 college season by meeting in the second annual Sydney Cup in Sydney, Australia on August 26. The game in Australia will mark the first time the Owls have played a football game outside the United States and also marks the earliest they have opened a season. Rice and Stanford met for the first time since 1964 to close out the 2016 regular season, with the Cardinal taking a 41-17 decision. The Owls hold a 3-2 lead in the all-time series. “This is a unique opportunity for us, one that I’m not sure we will have again in the near future,” Rice Director of Athletics Joe Karlgaard stated. “The Pac-12 has been expanding its outreach in the Pacific Rim the last few years, and we are excited to partner with Stanford for the game in Australia this fall. For our football players, many of whom have never been abroad, this trip will be as much about experiencing a new culture as it will be about the game itself." "This is an amazing opportunity for our players to represent Rice on such a unique stage and also expose them to a part of the world that most of them might otherwise never get to visit in person,” Rice head football coach David Bailiff noted. “It's a great opportunity to promote our school, our city and this game we love to the fans in Sydney”. In addition to their normal preparation leading to the game against Stanford, the Owls will participate in several cultural and educational activities during the eight-day trip. The historic trip to Australia for the Owls is another in a series of landmark trips for Rice student-athletes. The Rice baseball team traveled to Cuba at the end of November last year. Presented by TLA Worldwide and TEG Live, and the government of New South Wales, this year’s game will be played in Allianz Stadium, Sydney’s premier venue for rugby and soccer. Anthony Travel, the fan travel partner for the Sydney Cup, is now offering official travel packages which feature hotel accommodations, admission to an exclusive welcome reception, pre-game tailgate admission and much more. Although game tickets are not currently available for individual sale, travel package guests may purchase a package with game ticket in the best location on the Rice sideline. Interested fans can visit their website http://www.sydneycuptravel.com/rice or call 877-260-0645 to make their reservations. For those fans wishing to make their own plans, ticket sales will begin in Australia on Sunday, February 12 at 9 p.m. (Houston time). For all ticketing information, head to www.ticketek.com.au. While this will be the first time the Owls football team has competed internationally, the Sydney Cup will mark the fourth time a pair of NCAA teams have been played in the country. In 1985, Wyoming defeated UTEP 24-21 in the Australian Bowl which was played in Melbourne and two years later BYU downed Colorado State 30-26 in the Melbourne Bowl. NCAA football returned Down Under after an absence of 29 years when California and Hawai’i met in the first Sydney Cup to kick off the 2016 college season, with the Bears taking a 51-31 decision. The New South Wales (NSW) Government Minister for Trade, Tourism and Major Events and Minister for Sport, Adam Marshall, said he was thrilled to have college football action returning to Sydney in what will be an action-packed afternoon and a boost to the local economy. “The game between Stanford and Rice will be even bigger, featuring marching bands, cheerleaders, mascots, and traditional American stadium food,” Marshall said. “It is anticipated to attract more than 19,000 domestic and international visitors to Sydney – an influx which is estimated to inject around $14 million in visitor expenditure into the local economy,” Marshall added. TEG CEO Geoff Jones and TLA Worldwide Chairman, Bart Campbell, are excited to have such an iconic event return to Sydney. “The NCAA College Football season opener is a truly landmark event on the Australian sports calendar for 2017,” said Jones. “TLA and our partners are determined to build on the success of last year’s debut and create an even better live experience this year,’ Campbell added.